A smaller version of the floor standing Wright world globe features a fully up to date political map with a contemporary slate grey ocean. 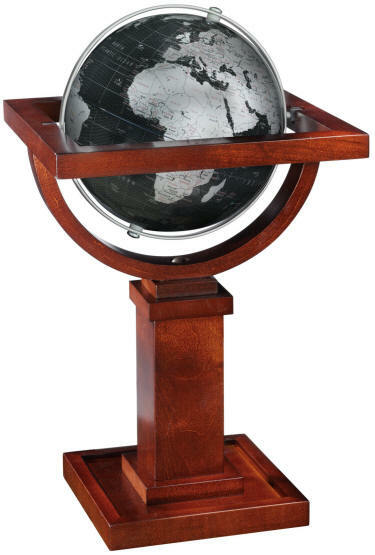 The 16" Wright globe is supported by a full swing metal meridian. The floor stand is inspired by a drawing found in the Frank Lloyd Wright Foundation archives. It is an unidentified concept for one of the Prairie Homes that Mr. Wright designed in the early 1900s. Cradling a 6" diameter globe, the maple stand's proportions were calculated to match the scale of other drawings from this time period. * A portion of the sales supports the conservation and education programs of the Frank Lloyd Wright foundation.